Halbstadt Zentralschule, Halbstadt, Molotschna Mennonite Settlement. ca. 1900. Halbstadt Zentralschule, Molotschna, Russia, found­ed in 1835, was the second Mennonite secondary school in Russia. The initiative for the founding of the school was given by Faddeyev of the De­partment for Foreign Settlers to train teachers, secretaries, and to promote the Russian language among the Mennonites. Orphans and children of poor parents received free training, for which they were obligated to serve the community for pay for a number of years. At first the school was de­pendent on the Oberschulze of the district and the level of education was rather low (1835-70). Among the teachers of this period were Johann Neufeld, Abraham Ediger I, Johann Voth, Peter J. Neufeld, Jacob Wiebe, and Gustav Rempel. Some of the outstanding graduates during this time were Daniel Fast, Johann Claassen, and Bernhard Harder. In 1869 the school became subject to the newly organized Molotschna school board (Molotschnaer Mennoniten Schulrat). Before this time the school offered a two-class course consisting of four years. Now two years were added. The graduates re­ceived a certificate. The standard of education was raised considerably. In 1878 a two-year teachers' training course was added. 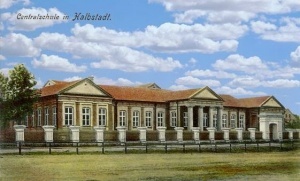 The Neu-Halbstadt elementary school became the "model school" (Musterschule) in which the students did their practice teaching beginning in 1879-80. The two basic classes (Grundklassen) of the Zentralschule, consisting of two years each, were changed into three-class courses, each consisting of a year (1884-85). Some of the outstanding teachers before World War I were Kornelius Unruh, Peter J. Neu­feld, Peter M. Friesen, Heinrich Franz II, Hermann A. Lenzmann, P. A. Ediger, D. H. Hamm, W. P. Neufeld, P. P. Fast, Kornelius Bergmann, D. J. Klassen, Hermann Penner, Abraham Klassen, Abraham Töws, and Peter J. Braun. Braun, P. "The Edu­cational System of the Mennonite Colonies in South Russia." Mennonite Quarterly Review III (1929): 168-82. Braun, P. "Das Mo­lotschnaer Mennonitische Lehrerseminar in Halbstadt, 1878-1922." manuscript, Bethel College Historical Li­brary. Friesen, Peter M. Die Alt-Evangelische Mennonitische Brüderschaft in Russland (1789-1910) im Rahmen der mennonitischen Gesamtgeschichte. Halbstadt: Verlagsgesellschaft "Raduga", 1911 : 596-612. Froese, Leonhard. Das Pädagogische Kultursystem der mennonitischen Siedlungsgruppe in Russland. Göt­tingen, 1949. Krahn, Cornelius. "Halbstadt Zentralschule (Halbstadt, Molotschna Mennonite Settlement, Zaporizhia Oblast, Ukraine)." Global Anabaptist Mennonite Encyclopedia Online. 1956. Web. 19 Apr 2019. http://gameo.org/index.php?title=Halbstadt_Zentralschule_(Halbstadt,_Molotschna_Mennonite_Settlement,_Zaporizhia_Oblast,_Ukraine)&oldid=135478. Krahn, Cornelius. (1956). Halbstadt Zentralschule (Halbstadt, Molotschna Mennonite Settlement, Zaporizhia Oblast, Ukraine). Global Anabaptist Mennonite Encyclopedia Online. Retrieved 19 April 2019, from http://gameo.org/index.php?title=Halbstadt_Zentralschule_(Halbstadt,_Molotschna_Mennonite_Settlement,_Zaporizhia_Oblast,_Ukraine)&oldid=135478. Adapted by permission of Herald Press, Harrisonburg, Virginia, from Mennonite Encyclopedia, Vol. 2, pp. 633-634. All rights reserved. This page was last modified on 5 August 2016, at 16:39.